There is a special kind of gravity that surrounds musicians who dedicate significant time to their craft and do it with a purpose, devotion and desire to be heard. This force forms the sense of quality that often transcends the musical boundaries and serves to inspire and motivate anyone who has the ears to listen. Now imagine triple that force and you will get the right feel for the TRIAD collaboration. In this self-titled EP you find three outstanding artists, brought together by their passion for good music and respect for each other’s work ethic. The result is a soulful, hip hop-inspired three-part project with a strong message. We're absolutely excited to have the honour to host the EP on our SoundCloud it and share the premiere of this masterpiece. 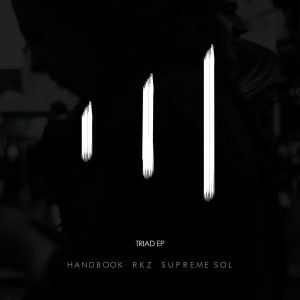 TRIAD is formed by York-based producer Handbook , St. Louis rapper Supreme Sol (part of the Pragmatic Theory collective) and Luton singer RKZ. Handbook, a prolific representative of the ROOTNOTE collective, was perhaps the catalyst for this collaboration as he has worked with the other two on previous tracks. His production for Sol dates back long time ago and have continued throughout the years with releases like "One More Time" and "Values", while him and RKZ recently teamed up Chino XL for their collab "They Don't Know Nothing". It appears that it was only a matter of time till the universe brought them in the studio together. The EP opens with the track "Bad", which really is a statement track that perfectly showcases the fusion of talent. Handbook does an absolutely amazing job with the beat full of texture sounds over hard hitting kicks, while Supreme Sol opens with a verse about the importance of breaking the chain of the ordinary and not being afraid to dream. RKZ adds to that idea in the hook with a simple question - "Could it be so bad?". This track forms the overall message for the EP, which develops further on "The World's Mine". Inspired by Nas’s similarly titled track off Illmatic, RKZ goes back to his rap days with a pair of verses that channel his understanding of that fact and vents about artists relying on others rather than themselves to achieve success. The UK rapper on the other hand has stayed creative and on the grind. He is not phased if you hate him, he is living his dream and is motivated to succeeded and so should you. Stand out track for me personally was the final "TRIAD". Sonically, this was my favorite beat from Handbook, a soulful melodic composition that helped Supreme Sol drop his best verses on the project. His rapping on this track reminded me a lot of Andre 3000’s cadence and Talib Kweli’s passion on their earlier 90s work. After this track I found myself digging through his discography to find some great projects like the album Our Minds Come Upon The Eternal as his alter ego Edgar Sabali. There he tackles some profound concepts over his usual rapid-fire flows with some amazing production. Also, don't miss out on his track Vast Emptiness with Handbook to see what I am talking about. Pay attention to this cat, he’s got a lot to say. Overall, I can say that for an EP, this is a seriously cohesive project with a great message, performed by three artists that work perfectly together. Sound-wise, it’s all you can ask for – dope production, real spitting with a purpose, memorable and soulful hooks. A great collaboration, which I can only hope will continue to produce together in the future. The EP is available for free download and if you want to support those talented artists, follow them on social media - RKZ (Twitter/SoundCloud), Handbook (Twitter/SoundCloud) and Supreme Sol (Twitter/SoundCloud).